Taoist Tai Chi - Every Tuesday and Thursday evening we see the unusual sight of a large number of people gliding across the hall floor. TAI CHI is a combination of exercise and relaxation. It sets your mind at ease while smoothing out your tired muscles. With the able help of the instructors you will learn the simple moves to relax your mind and body. The Church of the Nazerene has been with us before and we would like to welcome them again. Worship every Sunday morning at 10:30 and would welcome all to join him. Sackville Photo Club - Do all of your pictures look like your two year old took them. Are you a budding Karsh of Ottawa but need the inspiration of others. 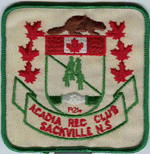 Then the Sackville Photo Club is the place to go. On the 1st and 3rd Wednesday of every month the club meets to exchange ideas and learn from other who have been there. They are a friendly bunch and will welcome all no matter how well you take pictures. The Mayflower Garden Club will be gracing our hall on the 2nd Wednesday of every month. This one is definitely a hit. When handing over the key on the first meeting night I was taken by the organization of the group and almost stayed myself. And kicked myself later for not going. I wish the group luck and hope to have them as part of our FAMILY for a long time to come. The Warm Wishes Charity Quilters meet weekly for quilting and social interaction to make quilts for charity purposes. Offering Classes for Everyone; From New to Yoga to Experienced Yogis. We are certified yoga instructors based in the Bedford/Sackville community who teach in spaces we love (like the historic community centre Acadia Hall). We strive to provide our practice in a safe and nurturing environment. Join one of our 6 week sessions for 60$, or try a Drop-in class for 13$.